Malcolm Brown was once described as a 4 letterman because of his outstanding sports performance in his high school days as he partook in three main sporting activities leading his team to their first State Championships in Football, Track event and even the basketball. The American National Football League Player was signed by The Lose Angeles Rams in 2015, as an undrafted free agent, where he currently wears the No. 34 shirt of the team. He rose to become the team’s backbone and handcuffs, as well as Todd Gurley main back up on the pitch, he was just what his team needed. Although he has been out of action due to injury in December 2018, many would love to see him on the pitch against the New Patriots doing the stuff he is made of. Malcolm Brown was born in Biloxi, in Mississippi, US on 15th day of May 1993. Although not much is known about his early years and upbringing, one thing we know is that he was educated in the public school District school, Byron P. Steele High School located at Cibolo, in the Suburbs of the 7th most populous city in the US – San Antonio, Texas. He actively participated in 3 sporting activities of the high school; he ran the tracks, played the Basketball and football games. He was so good at the sports especially the football that he was a vital force in his team leading them to their first ever Class Division 2 State Championship in the football, the track, and basketball games during his 2nd year. In his senior year, he racked up amazing 30 touchdowns and rushing 2,596 yards. No wonder Malcolm Brown during his high school days was described as a four-year letterman, a term that explains that a high school student or college student has met all specified level of performance in the team. No wonder he clinched the USA Today High School All-American nomination awards (2010), U.S Army All-American Bowl award (2011) and became a 5-star recruit prospect for the Rivals.com. The doors of college agents soon swam open with some colleges competing for him to join their varsity team. Top on the list of schools that gave him admission were the Universities of Oklahoma, Florida, Stanford, Notre Dame and Texas from which the young star chose the University of Texas. The 5-star recruit soon showed the stuff he was made up; though he started with his college football team in 2011 as the 3rd man of the depth after Fozzy Whittaker and Cody Johnson. His debut with the team saw him Rush 86 yards on 16 carries in their game against Rice Owls in September 2011. His second appearance on the pitch, inspired their win against the BYU Cougars with his 86 rushing yards on 14 carries sealing it his 3rd run that gave his team 1 point win in the game that ended as 17 to 16. Brown game kept improving with each game, his best season performance was against the Kansas, Oklahoma and Iowa State, as he racked up a total of 33 rushing yards on 11 carries, 54 yard rushes on 17 carries, and 63 yards on 15 carries rushed in three games respectively. Sadly, in October, 2011 he sustained a foot injury that slowed his speed, hence, he ended the season as the second team Freshman All-American for the Yahoo Sports, although he also took the title of his team-leading rushing man and he thus recording his name on the school history book as their true Freshman after Cedric Benson (2001). He ended the season with the score of 5 touchdowns, and 742 rushes on 172 carries. After 4 years, playing in 44 games Malcolm Brown bowed out of college football with a score of 2,678 yards rushes on 630 carries, earning himself, the second team All-Big 12 title in 2014, which probably attracted the Saint Louis Rams in signing him on May 2015 as a free agent, 4 months later he joined their practice squad. He started his season regular game against San Francisco 49ers, in January 2016, recording 17 yards rushing on 4 carries. His performance was good enough to get him into becoming the 2nd running back man after Todd Gurley on the team in 2017. His team scored 37 points, ahead, leading to their 46 to 9 win, in the team’s season-opening game where Brown recorded a personal effort with a debut touchdown, 3-yards rushes in the 4th quarter against the Indianapolis Colts. 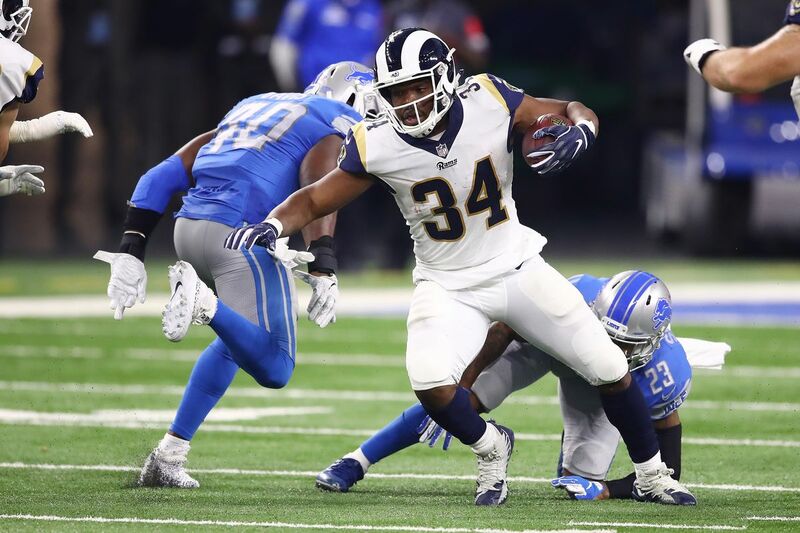 He was made a starter when Gurley was on rest, in the 17th week of the season and he did not disappoint as he recorded 4 carries for 54 yards rushes. He wrapped up 2017 season with 9 receptions, for 53 receiving yards, a rushing touchdown, rushes of 246 yards. The player currently earns about $630,000 salary per annum, which has not diminished his play with his team. He was chosen as the main backup for Todd Gurley in 2018 and his 2018 season records are 212 yards with 5 receptions for 52 yards rushes and a touchdown in all 12 games played, before he was brought down by Clavicle injury (Broken Collar bone) on 3rd of December 2018 in their game against the Lions. He was out of action for the rest of the month as he underwent surgery and he has been recovering. The 2 rookie substitutes; John Kelly and Justin Davis became back up to Todd for all 4 final games the team had. They all got their team into the Super Bowl LIII in the absence of Brown. They will be knocking horns with the old-time rival, Tom Brady’s New England Patriots. The parents of Malcolm Brown are reported as LaShune Brown and Tommy Brown although nothing more is known about their background. Malcolm is young, successful and in the prime of his career. The athlete is presently not married and has never been married. He also has no children, as he has probably chosen to focus more on his budding career. The athlete, however, has succeeded in keeping a low profile when it comes to his personal relationships, so it may not be surprising to hear that he has a girlfriend; although, officially, for now, Malcolm Brown is single. The Biloxi born American footballer has a towering height, standing at a height of 5 ft 11 inches (1.83 m) while his frame is complemented by the weight of 102 kilograms (224.8 lbs).